Designed to finagle those fickle bass into biting, our ned monsters flit across the bottom, undulating with each pause. The medusa-like attachment enhances motion and water displacement to trigger your next big strike! Each wire guard ned monster is 4 inches long and packs can be purchased in 2 sizes (1/8 and 1/4 oz.) 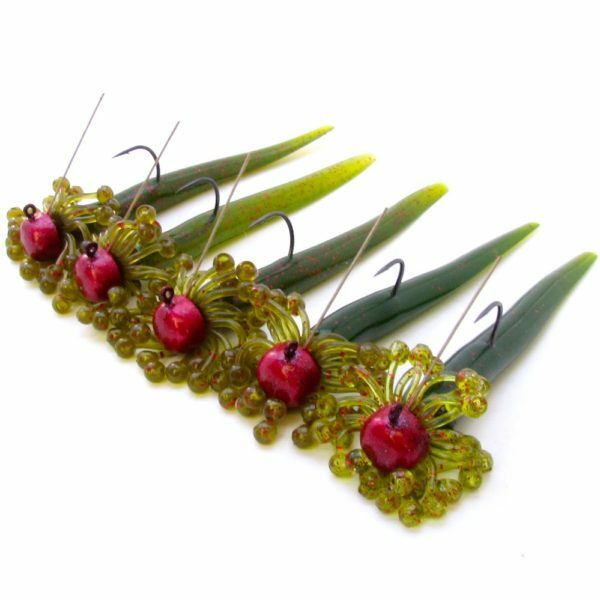 and are available in multiple fish catching colors! There are 5 fully assembled ned monsters per pack. Note: Our Ned Worm Tails are buoyant underwater and will stand straight up when on the bottom. SHIPPING NOTE: OUR NED MONSTERS ARE MADE TO ORDER. ALLOW 5-7 BUSINESS DAYS FOR YOUR ORDER TO BE SHIPPED.